Like Pittsburgh, Rochester has had to reinvent itself. Old economy companies like Eastman Kodak and Xerox have lost much of their importance and reduced their workforces. The slack has been picked up by such newer companies as Paychex, a successful payroll-service company headquartered there, as well as high-tech optical companies. The current unemployment rate of 8.1% is was well below the national average of 9.6%. Rochester is also a learning center with the University of Rochester, which hosts both the foremost optics research center in the nation and the Eastman School of Music, a premiere music institution. A few years ago, the university surpassed Kodak as the city's largest employer, with more than 17,000 workers. Another notable outpost of academia is the Rochester Institute of Technology and there are several smaller colleges. Rochester home prices never bubbled during the boom, but they have enjoyed slow, steady growth during the bust, gaining 5.2% over the past three years*. Since many of the area's jobs pay reasonably well (the median household income is $63,000, which is above the national median), the relatively affordable housing market has been open to most of the population. The prices also meant few homebuyers resorted to toxic mortgages, and New York's strong consumer protection laws tended to discourage predatory lending. 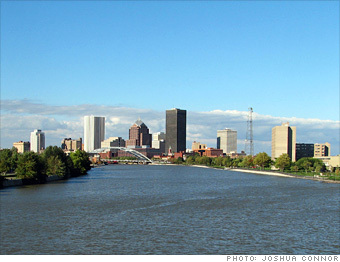 As a consequence, Rochester has been less burdened by foreclosures than most big markets. Only one property for every 276 had a foreclosure filing against it during the first six months of 2009, about a third the national rate.